After failing to win an Academy Award in 2002 for her brave performance in Unfaithful (losing out to Nicole Kidman in The Hours), cynical pundits surmised that Diane Lane took on the role of Penny Chenery, the owner of the legendary race horse Secretariat, as a blatant attempt to follow in Sandra Bullock’s Oscar-winning footsteps with a Blind Side-esque film that would appeal to Academy voters. One does wonder if Lane, frustrated at not getting an Oscar for a challenging role, opted to play it safe this time out with a family-friendly Disney film. Regardless, the talented actress once again gave it her all in Secretariat (2010), a film that was relatively well-received by critics and performed decently if not unspectacularly at the box office. Secretariat chronicles the life of the race horse of the same name and how his owner, Penny Chenery (Lane), and trainer, Lucien Laurin (Malkovich), were instrumental in him winning the Triple Crown of Thoroughbred Racing in 1973. After her mother dies, Penny helps her brother (Baker) organize their parents’ estate and this includes several horses that her father (Glenn) almost sold. After finding out that the family trainer tried to sell the horses illegally, she fires him and takes control herself. Having little to no knowledge about horses, Penny asks eccentric trainer Lucien to help her but he’s lost interest in the sport of horse racing. 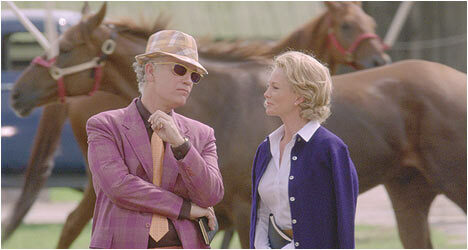 However, he changes his mind and is soon training a newborn horse that has none of the traditional racing traits. The rest of the film follows the sports movie template as it tracks Secretariat’s unconventional rise and the sacrifices Penny makes and the obstacles she faces along the way. What makes this predictable tale watchable is the performance of Lane and John Malkovich. They play well of each other as her strong-willed optimist goes up against his curmudgeonly character. Visually, they are a study in contrasts as Penny dresses conservatively while Lucien sports all kinds of flamboyant attire. Their scenes together crackle with an energy that is fun to watch. Director Randall Wallace does a good job of conveying the energy and excitement of a horse race through editing and dynamic point-of-view angles that put you right in the race. You can’t help but get caught up in them even though their outcomes are known. Lane delivers inspirational speeches like a trooper and does a good job portraying the real-life Penny. This role may not get her an Oscar but no one could accuse her of phoning in her performance in an entertaining and engaging film. “Heart of a Champion” is your standard making of featurette as cast, crew and horse racing experts talk about Secretariat and bringing his extraordinary story to the big screen including some fantastic vintage footage of him in action. Best of all, the real Penny tells her side of the story. Also included are three deleted scenes with optional commentary by director Randall Wallace. They shed a bit more light on Penny’s home life and there is also a bit more character development. Some of this footage disrupted the flow of the film or was redundant. Finally, there is a standard movie tie-in music video for “It’s Who You Are” by A.J. Michalka. The video cuts footage of her performing with clips from the film.